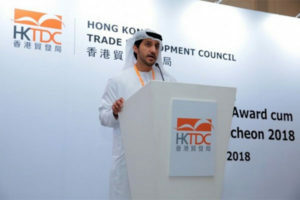 Non-oil trade figures between the United Arab Emirates (UAE) and Hong Kong have increased by 5.1 per cent reaching $8.9bn last year compared with 2016, making the Gulf country the leading Middle East partner of the Chinese autonomous territory. Juma Al Keet, assistant under-secretary for Foreign Trade Affairs at the UAE Ministry of Economy (MoE) told reporters that there are still large avenues for greater trade exchange between the Gulf country and China. “There are great potentials for forming more fruitful partnerships between the two countries, with a focus on SMEs, technology, tourism, renewable energy, infrastructures and finance and banking as they feature high in the development agenda of both countries,” Al Keet said. The the UAE official was speaking at the 6th edition of Hong Kong Lifestyle Expo – Dubai, organized by the Hong Kong Trade Development Council (HKTDC). The UAE and China’s trade ties have increased significantly in recent years and are expected to scale up many folds in the framework of the initiatives and development projects of China’s One Belt One Road Initiative that focuses on building trade and investment partnership between countries in Asia, the Middle East, Africa and Europe. Written by: KanelkaTagba on June 27, 2018. Posted by KanelkaTagba on Jun 27 2018. Filed under Gulf News, Headlines. You can follow any responses to this entry through the RSS 2.0. Both comments and pings are currently closed.